The difference between an attorney-in-fact appointed to act under a power of attorney and an executor appointed to act under a last will and testament is literally the difference between life and death. The principal, or maker of a power of attorney, appoints an attorney-in-fact to handle her affairs during her lifetime. The maker of a will, or testatrix, however, designates an executor to handle her affairs after death. If you are appointed as attorney-in-fact under a power of attorney, you will be authorized to act on behalf of the principal during her lifetime. The power of attorney may be very specific, only authorizing you to perform certain actions, like signing a deed for a particular piece of property. It may, however, be very broad and general, authorizing you to perform any act that the principal could perform herself if present. Note that the person to whom you present the power of attorney may refuse to accept it. For instance, a title company may refuse to accept a power of attorney without durable language or one that is not notarized properly according to state law. Durable language in a power of attorney simply states that the power of attorney will remain effective even if the person who made it becomes mentally disabled or incompetent. 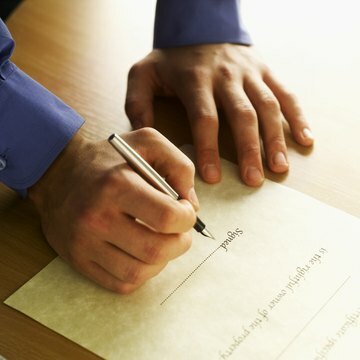 Whereas an attorney-in-fact is granted his authority when the principal signs the power of attorney, the executor is not fully authorized to act until the judge signs an order -- called “Letters Testamentary” -- granting him that authority. Your powers as executor are given by the will, but only become effective when the will is accepted for probate and the court enters the appropriate orders. The principal may revoke her power of attorney by executing a document called "Revocation of Power of Attorney." This revocation should be filed in the county land records where the principal lives and transacts business. If at all possible, the principal should obtain and destroy the power of attorney that is being revoked. Whereas an attorney-in-fact may only have his powers revoked by the principal, an executor may only be removed by the court. The heirs and beneficiaries will have to prove to the court that the executor is not acting in their best interest according to the instructions given in the will and is permitting waste of the assets of the estate. Can You Use Power of Attorney When a Person Is Alive? If you wish to give another person the authority to make important decisions and act on your behalf, you may draw up a power of attorney, or POA. This document allows an agent to sign documents or otherwise act in your place. A specific POA grants authority over a single matter or field, while a general POA gives blanket authorization in any and all matters, as allowed by state law. The POA expires under certain circumstances, including death. Does Power of Attorney Become an Executor of the Will Automatically?